Kratko uputstvo za nabavku Panasonic telefonskih centrala !!! Centrale KX-TEA308, KX-TES824 I KX-TEM824 imaju integrisan DISA sistem-produženo biranje-automatski prijem poziva na lokal. 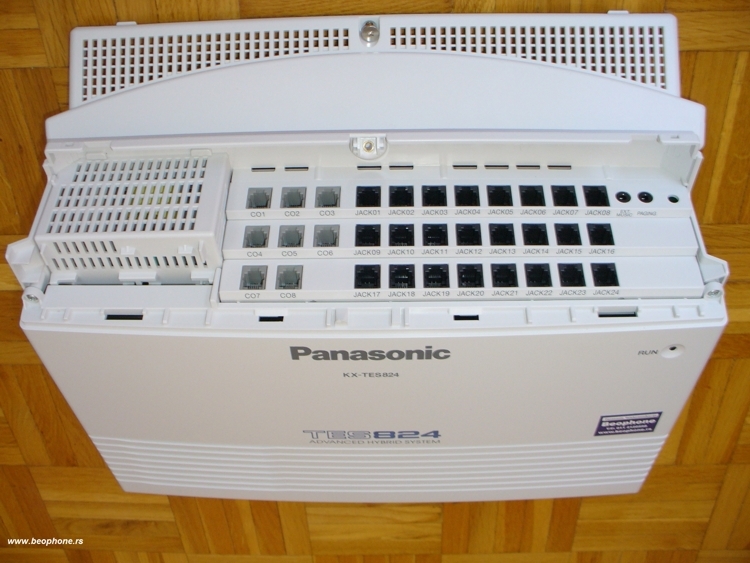 Telefonske centrale Panasonic KX-TES824 CE imaju kapacitet 3 ulazne linije i 8 lokala. Proširenje telefonske centrale KX-TES824CE je moguće, do 8 ulaza i 24 lokala. Ponudom mogućnosti kakve se retko nalaze u ovoj kategoriji, Panasonic-ov telefonski sistem KX-TES824CE označio je korak napred na području telefonskih sistema za mala preduzeća. Telefonska centrala Panasonic KX-TES824 ima fabričku konfiguraciju 3 ulazne linije i 8 lokala (radnih mesta), može da se proširi na 6 ulaza / 16 lokala, 6 ulaza / 24 lokala, i 8 ulaza / 24 lokala, maksimalan kapacitet 8/24. Jedan GSM Gateway podržava jednu GSM karticu i potreban mu je jedan ulazni port na telefonskoj centrali Panasonic. Cena. 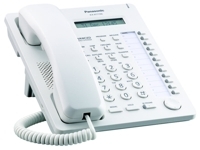 Panasonic KX-NS500, IP centrala, 6 portova za analogne telefonske linije, 2 porta za digit. lokale, 16 portova za analogne lokale, proširiva. Telefonske centrale Panasonic Beograd Srbija, prodaja, montaza, programiranje, servis, servisiranje, cena, cene, Beophone d.o.o. Beograd, Telefonska centrala. Up to 24 extensions The KX-TES824 CE is initially configured to 3 exchange lines and 8 extensions. With optional cards you can easily expand the capacity up to 8 exchange lines and 24 extensions. 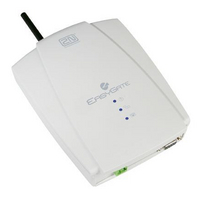 The system comes with built-in DISA / Message on busy, Extension Caller ID, Remote Modem and USB Port for PC Programming. Featuring DISA (Direct Inward System Access) which allows outside callers to access any extension without going through an operator. Automatic greeting messages can be recorded by the operator of manager, directing the call to an appropriate department or destination. The system is smart enough to even detect an incoming fax transmission - routing the call automatically to a designated fax extension. Extension Caller ID compatibility displays the incoming caller's phone number or name when used with a Panasonic proprietary display telephone. Up to 20 calls can be logged per extension. The Optional Voice Message Card ensures you will never miss a call when you are not available. You can customise you voice mailbox, by recording your own greetings which will be played when you cannot answer your phone. This system supports the KXT7700 series range of telephones (KXT7735, KXT7730, KXT7720 and KXT7750). Panasonic telefonske centrale, prodaja, montaza i programiranje u svim gradovima Srbije.. The KX-HTS32 is an advanced Hybrid IP-PBX for SMB. It has a capacity for up to 24 extensions to exactly meet the scale of SMB market. 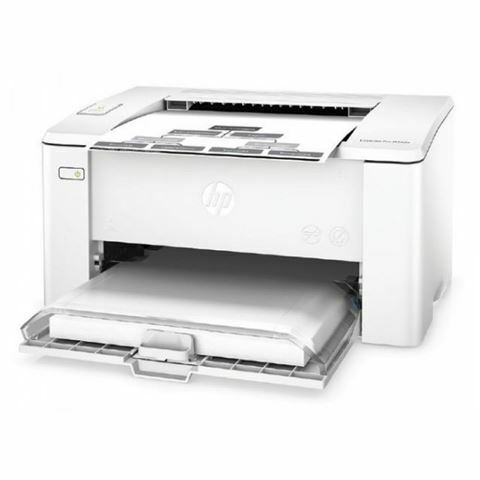 Priced affordably while possessing all the necessary standard functions built-in. The KX-HTS32 is a SIP trunk ready system, and no external devices need to be purchased for IP usage. Another unique feature is the built-in router and Wi-Fi access point. The KX-HTS32 works as a voice processing platform and also as a network device. A full line-up of terminals is available for the KX-HTS32, enabling optimal communication for SMB businesses. This system also achieves exclusive simplicity for setup and maintenance. Even for business trends such as BYOD (Bring Your Own Devices), the KX-HTS32 brings you a solution with built-in functionality. The Panasonic KX-NS500 Smart Hybrid PBX is a cost effective legacy and IP communication system for small and medium sized companies that can be flexibly configured and expanded according to your needs. The KX-NS500 has advanced features and starts from 6 analogue trunks and 18 extensions, up to 288 extensions with an Expansion Unit. The KX-NS500 is also a unified communication system which has rich IP features such as mobile linking, integrated voice mail and e-mail, instant messaging (chat), and presence information. It can also use built-in applications, such as a call centre solution, mobile solution, and voice mail system, to provide more efficient work and increased customer satisfaction. The KX-TDA15 is a Hybrid communication solution designed for small business to provide intelligent call handling, and is ideal for up 20 users The KX-TDA15 is a hybrid IP PBX system, optimised to meet the needs of small businesses today and into the future. It can be configured to meet existing needs and expand as requirements grow or change. The KX-TDA15 combines PBX reliability with IP technology offering efficient and flexible communication. The KXTDA15 cost effectively bridges the gap between the telecom requirements of today, and the demand for future integrated solutions. Applications include ; Voicemail, Call Management Software, Cordless Telephony (DECT), Integrated Headsets, Computer Telephony Integration (CTI), Remote Branches and Home Worker Solution. Telefonske centrale u Srbiji - Panasonic. The KX-TD30 is a Hybrid communication solution designed for small business to provide intelligent call handling, and is ideal for up 50 users. The KX-TDA30 is a hybrid IP PBX system designed to fulfil customer's requirements today and into the future. It can be configured to meet present needs and expand as requirements grow or change. The KX-TDA30 combines PBX reliability with IP technology offering efficient and flexible communication. The KXTDA30 cost effectively bridges the gap between the telecom requirements today, and the demand for future integrated solutions. Applications include ; Voicemail, Call Management Software, Cordless Telephony (DECT), Integrated Headsets, Computer Telephony Integration (CTI), Remote Branches and Home Worker Solution. Panasonic telefonske centrale Beograd Srbija. The Panasonic KX-TDA100 provides businesses with a low-cost intelligent communications system combined with a family of mobile and business applications for up to 160 users. The KX-TDA100 is a hybrid IP PBX system designed to fulfil customers' requirements today and into the future. It can be configured to meet present needs and expand as requirements grow or change. The KX-TDA100 combines PBX reliability with IP technology, offering efficient and flexible communication. The KXTDA100 cost effectively bridges the gap between the telecom requirements today, and the demand for future integrated solutions. Applications include ; Voicemail, Call Management Software, Cordless Telephony (DECT), Integrated Headsets, Computer Telephony Integration (CTI), Remote Branches and Home Worker Solution. Telefonske centrale Panasonic Beograd Srbija, prodaja, montaza, servis, servisiranje, programiranje, cena, cene, Beophone d.o.o. Beograd, Telefonska centrala. 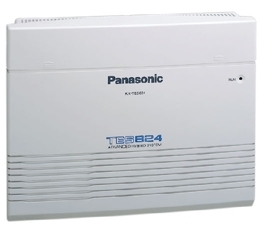 The Panasonic KX-TDA200 Hybrid IP PBX provides businesses with a low-cost intelligent communications system, combined with a family of mobile and business applications for up to 160 users. The KX-TDA200 is a hybrid IP PBX system that will fulfil customers' requirements today and into the future. It can be configured to meet present needs and expand as requirements grow or change. The KX-TDA200 combinies PBX reliability with IP technology, offering efficient and flexible communication. The KXTDA200 cost effectively bridges the gap between telecom requirements today, and the demand for future integrated solutions. Applications include ; Voicemail, Call Management Software, Cordless Telephony (DECT), Integrated Headsets, Computer Telephony Integration (CTI), Remote Branches and Home Worker Solution. Telefonske centrale Panasonic Beograd Srbija, prodaja, servis, servisiranje, montaza, programiranje, cena, cene, Beophone d.o.o. Beograd, Telefonska centrala. 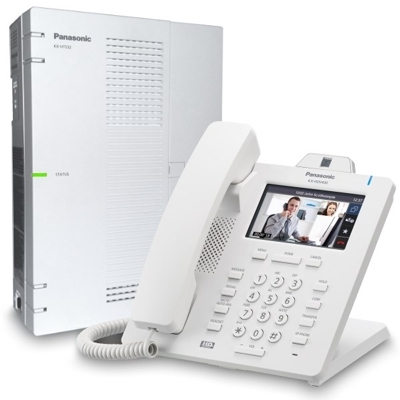 The Panasonic KX-TDA600 Hybrid IP PBX offers businesses a low-cost intelligent communications solution, combined with a family of mobile and business applications for up to 1000 users. The KX-TDA600 is a hybrid IP PBX system to fulfil customers requirements today and into the future. It can be configured to meet present needs and expand as requirements grow or change. Plus, with the KX-TDA600's free slot architecture, you can easily insert expansion cards and access new features as well as expand your capabilities. Packed with features, the KX-TDA600 is ideal for many different applications, including hospitality, call centres and mobile working. It also enables enhances efficiency, with support for DECT and IP handsets providing mobility and flexibility around the office, site or network. The KX-TDA600 can also integrate with the KX-TVM voice range with integrated email delivery. Utilising the gateway and extender or IP handsets, homeworkers and remote branches can access the features of your central communication platform. Built on twenty years experience of developing business communications technology, the top of the range hybrid IP PBX KX-TDA600 works seamlessly with IT, and combines voice and data in one low cost Hybrid solution. Telefonske centrale Panasonic Beograd Srbija, prodaja, montaza i programiranje telefonskih centrala Panasonic. Telefonske centrale Panasonic Beograd Srbija, prodaja, montaza, programiranje, servis, servisiranje, popravak, cena, cene, Beophone d.o.o. Beograd, Telefonska centrala. Telefonske centrale Panasonic Beograd Srbija, prodaja, montaza, programiranje, servis, servisiranje, popravka, cena, cene, Beophone d.o.o. Beograd, Telefonska centrala. The KX-TDE200 Pure IP PBX is an advanced corporate communication system providing IP telephony features and functionalities over both local and broadband IP networks The Panasonic KX-TDE IP PBX series are advanced communications platforms for IP networking environments. 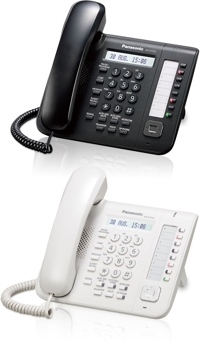 Along with SIP connectivity for desktops and networks, the systems support a range of advanced IP telephones. The platforms can be configured with a range of standard digital & analogue extensions, Digital and ISDN trunks, for maximum flexibility. Couple this with a Business Application environment, and you have a system ready to take your business communication needs into the 21st Century, at your own pace. A straight forward and smooth migration path is the key for customers upgrading to converged solutions. Existing KX-TDA systems can be easily upgraded to the KX-TDE systems by simply replacing the main processor card (IPCMPR) to take advantage of all the new features and benefit from true convergence. Panasonic telefonske centrale Srbija, prodaja, montaza i programiranje u Beogradu. Telefonske centrale Panasonic Beograd Srbija, prodaja, montaza, servis, servisiranje, popravak, programiranje, cena, cene, Beophone d.o.o. Beograd, Telefonska centrala. The KX-NCP500 is an advanced communication solution ideal for up 64 users, equipped with voicemail, digital and IP Telephone Support, Digital, IP Network Trunks and Applications. Network Communication Platforms are advanced communication solutions designed to enable businesses to achieve Unified Communications by enhancing & streamlining office communications with presence enriched productivity applications. Facilitating more effective ways of communicating with both your employees and customers - the NCP platforms allow anytime, anywhere access to a whole host of business communication applications via a range of smart and user-friendly wired and wireless devices. NCP platforms - enabling businesses to effectively reach, serve and retain customers. Panasonic telefonske centrale Beograd. Telefonske centrale Panasonic Beograd Srbija, prodaja, montaza, programiranje, popravak, servis, servisiranje, cena, cene, Beophone d.o.o. Beograd, Telefonska centrala. Servisiranje telefonskih centrala Panasonic u svim gradovima Srbije. Održavanje telefonskih centrala Panasonic. Montaža i programiranje. Telefonske centrale Panasonic: prodaja, montaža, servisiranje, popravak, montaža, programiranje, održavanje, servis centrala Panasonic. Servis, servisiranje telefonskih centrala Panasonic. Prodaja, montaža i programiranje telefonskih centrala Panasonic. Telefonske centrale Beograd, Telefonske centrale Srbija, Telefonske centrale Crna Gora, Telefonske centrale Hrvatska, Telefonska centrala Crna Gora, Telefonska centrala Beograd, Telefonska centrala Hrvatska, Telefonska centrala Zagreb, Telefonska centrala Pogdorica, Telefonska centrala Skpoje, Telefonska centrala Makedonija, Telefonska centrala Macedonia, Telefonska centrala Kosovo i Metohija, Telefonska centrala Priština, Telefonske centrale Kosovo i Metohija, Pozivni broj, Telefonske centrale Priština, Telefonske centrale Kosovska Mitrovica, Prilep, Štip, Strumica, Bitola, Kumanovo, Prizren, Đakovica, Leposavić, Zubin Potok, Obilić, Kosovo polje, Telefonske centrale Vojvodina, Telefonske centrale Novi Pazar, Telefonske centrale Sjenica, Telefonske centrale Republika Srpska, Telefonske centrale Banja Luka, Telefonske centrale Bijeljina, Telefonska centrala Banja Luka, Banjaluka, Telefonske centrale Albania, Telefonske centrale Tirana, Telefonske centrale Budva, Telefonska centrala Beograd, Telefonska centrala Novi Beograd, Telefonska centrala Palilula, Telefonska centrala Savski Venac, Telefonska centrala SBB, Telefonska centrala Vektor, Telefonska centrala Orion, Telefonska centrala Telenor, Telefonska centrala PTT, Telefonska centrala Srbije, Telefonska centrala Telekom Sbija, Telefonska centrala VIP, Telefonska centrala MTS, Telefonska centrala MTEL, Telefonska centra cena, Telefonska centrala cene, Telefonska centra servis Panasonic, Panasonic telefonske centrale, Ponuda, tender, Javna nabavka, Telefonska centrala Novi Beograd, Novi Beograd prodaja, Investicija, Investicije, Programiranje, Setovanje, Montaža, Servis Panasonic, Panasonic servisiranje, Panasonic.de, Panasonic.rs, Panasonic.hr, Panasonic.it, Panasonic.ru, Panasonic.at, Panasonic.uk, www, www., www./, panasonic, kx-, kx, tca, ns, kx-ns, Beogrdaska telefonska centrala Palmotićeva, Popust. Telefonska centrala Beograd, Telefonska centra Telekom, Telefonska centrala Vlada, Telefonska centrala Beogradske elektrane, Telefonska centrala Infostan, Telefonska centrala Infostan, telefonska centrala grad Beograd, Telefonska centrala fakultet, Telefonska centrala Institut, Telefonska centrala Srbija, Telefonska centrala muzej, Telefonska centrala pozorište, Telefonska centrala Novi Sad, Telefonska centrala Kragujevac, Telefonska centrala Čačak, Telefonska centrala Užice, Telefonska centrala Podgorica, Telefonska centrala Niš, Telefonska centrala Priština, Telefonska centrala Kosovska Mitrovica, Telefonska centrala nabavka, Telefonska centrala Subotica, Telefonska centrala EPS, Telefonska centrala RB Bor, Telefonska centrala Zaječar, Telefonska centrala Negotin, Telefonska centrala Marakana, Telefonska centrla Zvezdara, Telefonska centrala Savski Venac, Telefonska centrala Novi Beograd, Telefonska centrala Vračar, Telefonska centrala Palilula, Telefonska centrala Satri Grad, Telefonska centrala Skupština, Telefonska centrala Šabac, Telefonska centrala Užice, Telefonska centrala Aranđelovac, Telefonska centrala škola, Telefonska centrala biblioteka, Telefonska centrala za internet, Telefonska centrala ip, IP Centrala, IP Telefonska centrala. PATCH CORD CABLE, KAT.5E KAT.6, KAT.6A, KAT.7, KATEGORIJE 5E, KATEGORIJE 6, KATEGORIJE 6A, KATEGORIJE 7, PATCH CORD CABLE, CAT5, CAT5E, CAT6, CAT6A, CAT7, CAT 5, CAT 5E, CAT 6, CAT 6A, CAT7, PATCH CORD, PRESPOJNI KABLOVI, MEĐUVEZA, KABL PATCH UTP, KABL PATCH FTP, KABL PATCH SFTP, KABL PATCH SSTP, KABL PATCH, BOJA, BOJAMA, U BOJAMA, TELEFONSKE CENTRALE, 0,5M, 1M, 2M,3, 4M, 5M, 7M, 10M, 15M, 20M, METAR, METARA, 2XRJ45, 8P8C, BAKAR 100%, CU, PARICE U METALNOJ FOLIJI, STRUKTURA 4X2AWG 26/7 ,TWESTED PAIR, PRESPOJNI KABL, PRESPAJANJE, PATCH PANEL, PEČOVANJE, MODULI ZA KABLIRANJE, PATCH PANEL, PATCH PANELI, MODUL CAT5, MODUL CAT5E, MODUL CAT6, MODUL CAT6A, MODUL CAT7, RJ45 CAT5, RJ45 CAT5E, MODUL RJ45 CAT6A, RJ45CAT6A, MODUL ZA PATC PANEL, RJ45 CAT7. SPAJANJE BEZ ALATA, KONEKTOR, KONKTOA, TELEFONSKE CENTRALE, HALOGEN FREE, TESTED UP TO 100 MHz, NETWORK, MREŽA, NETVORKS, MREŽE, Telefonske centrale. Telefonske centrale cene, Telefonske centrale cene, Telefonske centrale za firme, Telefonske centrale Panasonic, Telefonske centrale Wikipedia, Telefonske centrale cijena, Telefonske centrale u zagrebu, Telefonske centrale Siemens, Telefonske centrale za hotele, Telefonske centrale, Telefonske centrale Novi Sad, Telefonske centrale Beograd., Telefonske centrale Novi Sad. Telefonske centrale Beograd, Srbija, Panasonic.